Brewing with malt extract (liquid or dry) is the starting point for most new brewers. Today many homebrewers use malt extract as the dominant base for their beer. Editors Note: Author John Palmer and I have done a professional “How to Brew with Malt Extract” Video/DVD which shows hundreds of detailed shots of every step in the brewing process. Get it here! 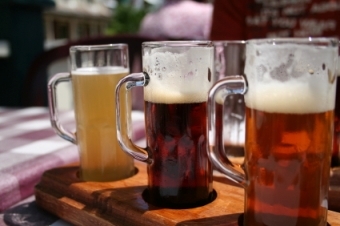 Malt extract brewers produce fantastic beer. Every year, even at the national level, malt extract brewers consistently finish in the winner’s circle. I hope this article helps you maximize the potential of malt extract brewing and helps you reach the winner’s circle as well. As always, keep your suggestions, social bookmarks and comments coming. Try DMEmart.com for really inexpensive DME, and free shipping to boot! I make 75 gallons of beer using a malt extract system, I buy 5 gls of the extract mix it with 70 galons of lukewarm water 1 oz. of granulated yeast and 30 lbs. of sugar; its fermented for 4 days; on the fifth day is cool by a glycol jacket outside the stainless steel tank and on the sixth day is carbonated with CO2 inside the tank.The beer is drinkable but I want the beer to be more hopier and bitter; does any one have any suggestions of how can I do that? The manufacturer of the malt extract tells me the only thing I need is to heat up the 5 gl. bucket of malt extract with a heat bracelet for 2 hours, add water @ 80 degrees 3/4 of the way add the yeast,glycol and CO2 on the fifth day and BINGO beer on the seventh day.Any suggestions how to improve the flavor? Al. I go against just about all advice on most of the blogs regarding hygiene. I no longer sterilize anything. 3. When you empty your container, is it the container still sterile ……….if YES then carry on. 5. Why on earth would you want to re-sterilize a sterile container??? I simply wipe mine out with a clean chuck cloth and the same water (in my case tap water) as I’m going to brew with. I simply rinse my kegs. No soap or chemicals! I empty my tin of extract into the wet pail, pour my brewing sugars of choice into the empty (apart from the residual extract stuck to the sides and bottom) tin and pour boiling water into it. The boiling water dissolves the sugars so you’re pouring hot (not boiling) syrup into the extract. Repeat depending upon how much sugar you use. Combine the syrup and extract using a spoon. I then use the tin to fill my six gallon container, filling the tin as fast as possible from the tap to get as much oxygen in as possible, and then pouring it into the pail – this method keeps down the froth but provides oxygen for the yeast. At about the five gallon mark, I pour yeast into the tin, then some water and pour it into the pail. (this takes the yeast right into mix and makes my final stir easy). After the final stir, I top up to the 6 gallon mark. With my latest (yet to be tasted) batch, I’ve simply poured my extract into the wet pail, added yeast and water (from the tap as previously described) but no hot water, no sugars and no stirring, to make up the 6 gallons. My logic is that I’ll be bottom brewing (I like lagers) and saving time – the whole process took less than 30 mins including transferring the previously finished beer to the keg. I should add that I’m neither a brewing buff, beer connoisseur nor a salesman. I simply like beer – especially light lagers. I’ve been brewing using liquid extract kits from the supermarkets for more than 15 yrs ( 5 using bottles 10 using kegs) and produce beer which is better (imo) than you’d pay for at a bar. The only ones I’ve produced which were off, were attributed to either soap or sterilizing chemicals after trying to do the right thing, spend loads of time and money, and sterilize – but probably not rinsing properly. Yeast is quite a tough little cookie and can normally sort out and tidy up the brew process providing there are no cleaning chemicals present. Obviously though, this applies to keg beer. If you don’t use your equipment between batches and it’s been lying around, you should start over with the cleaning / sterilizing. I’ve found that the quicker the process, the easier it is, there’s less chance of wild yeasts or other foreign bodies creeping in and ruining the batch. Also, I threw my hydrometer away years ago. A week to brew and at least a week to clear in the keg will probably give a similar result to working with specific gravity and at the end of the day, if it’s there or thereabout regarding required abv, and tastes how you want it, then why mess about. If it’s not quite right due to seasonal temperature changes or simply “I couldn’t bottle or keg my beer last weekend”, enjoy what you have and then make the slight changes next time. You’ll still have good and not so good batches anyway – using a hydrometer helps, but takes time and doesn’t guarantee success. Finally, though I’ve never progressed to producing my own malt and probably never will, too much time and money spent cleaning equipment and bottles, forever taking readings and fretting over the slightest thing that didn’t go by the book, nearly put a premature end to my home brewing. The best thing I could have done was invest in kegs. I actually have two fridges with kegs in each which allows me to alternate my brews. After an initial, quite expensive layout, a $12.00 kit (about the cost of two or maybe three bar bought pints) and 30 minutes work provides me with about 50 pints of drinkable 3.9% beer on tap, chosen from a bigger range at the supermarket than you’d find in any bar! And I still have the option of paying a bit more, experimenting with malts and yeasts and buying top quality beer kits at a brew shop – though they’d probably be wasted on me as I tend to guzzle! Alfredo i don’t know if you still come to the site, BUT……. I(PERSONALLY) like 1lb malt(+ 1lb) per 1 gallon water. you could use darker malt and different grains, other sugar(s) less/different hops but this same “basic” recipe and get different TYPES of beer. but if you want improved flavor i suggest adding hops or crushed grains or even just more malt. I saw glycol being used in a recipe above. Is that right because it’s toxic? He is referring to glycol being used as a coolant in the cooling jacket of an advanced system. The glycol in this case is a coolant for the system that cools the vessels, and not an ingredient in the beer. Do you know what percentage of the homebrewers/craft brewers use malt extracts to produce their beer? A little under 50% these days. Next post: Brewing Water – Hard or Soft?